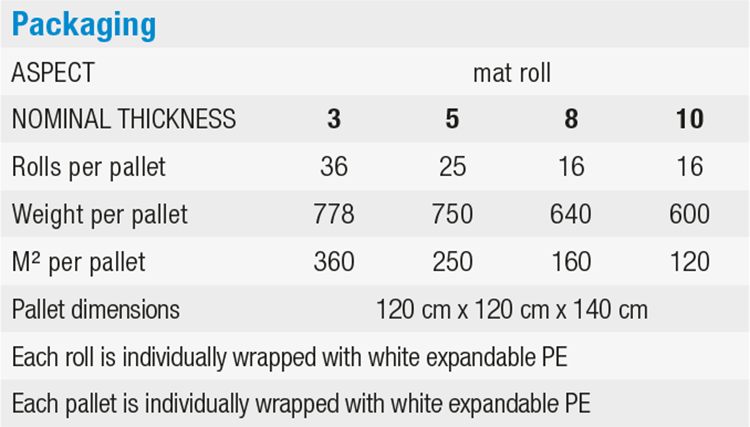 DAMPROLL is a rubber mat supplied in rolls, for prevent­ing impact sound. The use of a noble polymer-based binder with very high elasticity, along with the innovative surface of the mat, allow a high level of impact sound insulation which lasts well over time. DAMPROLL is made with rubber granules obtained from used tyres. It is characterized by a «skin» surface on the upper side and a «rough» finish on the side in direct con­tact with the surface to be insulated. DAMPROLL is used to create high-performance packages, as a resilient horizontal layer of separation. Apply DAMP STRIP L to the perimeter of the room to be insulated at the point of contact between the mat and the walls. Roll out the DAMPROLL mat with the smooth surface facing up. Pull the rolls flat and apply the special DAMP SCOTCH tape to the joins. The product is not subject to the obligation set out in Directive 67/648/ EEC. The compound does not contain formaldehyde, carbide fluorine, mer­cury or similar. It does not emit toxic fumes. as a function of the flow resistivity. The flow resistivity is dependent on the intrinsic properties of the material. 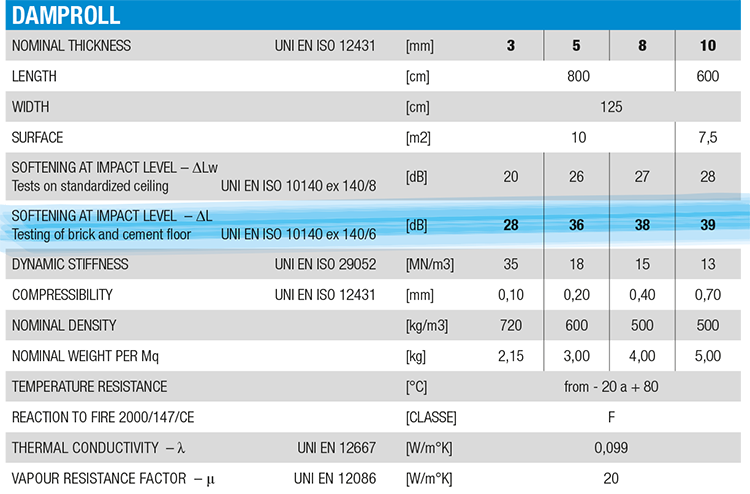 A process was set up to meas­ure the resistance to air flow (in standard EN ISO 29053) as a function of static load applied. 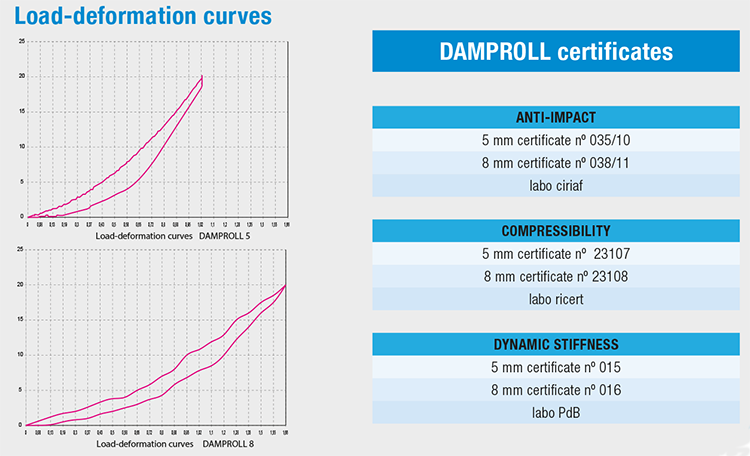 DAMPROLL’s resistivity to the flow of air «at compression» was checked, in order to discover the real behaviour of air within the material under operating conditions, i.e. under static load. This measurement was made by considering the peculiarity of the rubber material: the rubber granules are bound by a polymeric film, so the material is not classifiable as either fibrous or as porous (open cell), and has a considerable thickness associated with high porosity. The experiments carried out determined the resistance to flow, and then the resistivity as a function of the increase in static load applied. Since the data flow resistivity measured is much less than 10 kPa * s / m2, and the dynamic stiffness of the air s’a is significantly lower than that of the material, the data of apparent dynamic stiffness measured [s’t] coincides with the real dynamic stiffness of the material [s’].